President Moon Jae-in returned home on Oct. 21 from his trip to European countries in which he explained to European leaders his greater engagement with North Korea to ensure peace on the Korean Peninsula. President Moon’s trip to Europe got mixed reactions. Spokesman Hong Ik-pyo of the ruling Minju Party of Korea said, “President Moon’s visit to Europe had achieved beyond expectations.” “The Pope’s acceptance of his visit to North Korea” would be a great force to speed up peace process on the Korean Peninsula, he added. On the other hand, Spokesman Yoon Young-suk of the opposition Liberty Korea Party said President Moon should push for the solving of North Korean nuclear issue based on the international community’s solid collaboration, not representing North Korea’s intent. President Moon wrapped a nine-day visit to Europe, including Paris, Rome, Brussels, Copenhagen and the Vatican. Moon participated in the 12th Asia-Europe Meeting Oct. 18-19. On the sidelines of ASEM, the President held a Korea-EU summit with European Council President Donald Tusk and European Commission President Jean-Claude Juncker. President Moon attempted to persuade European leaders, to seek relief on sanctions against North Korea. But France and the UK, the permanent members of the U.N. Security Council (UNSC), and other European countries emphasized that the sanctions regime must remain in place until North Korea completely renounce its nuclear warheads, missiles and other weapons of mass destruction. President Moon was making a state and official visit to Italy on the second leg of his trip to European countries from Oct 13-18. On the second day of his official visit to the Vatican, President Moon was received by Pope Francis in a private audience. “I appreciate your thoughtful consideration in approving a special Mass for peace on the Korean Peninsula yesterday,” Moon was quoted as saying. President Moon also expressed his gratitude to the Pope for the warm welcome and always praying for peace, harmony and common prosperity on the Korean Peninsula as well as sending blessings and messages of support at every important juncture in the situation surrounding the Peninsula, the presidential office said. President Moon conveyed Chairman Kim Jong Un’s desire to invite the Pope to North Korea, Cheong Wa Dae said in a briefing. “When I visited Pyongyang last month, I suggested to Chairman Kim that he meet with the Holy Father, who has a great interest in peace and prosperity on the Korean Peninsula, and Chairman Kim instantly expressed his active intent to convey hospitality and enthusiastically welcome the Pope should he visit Pyongyang,” President Moon was quoted as saying. 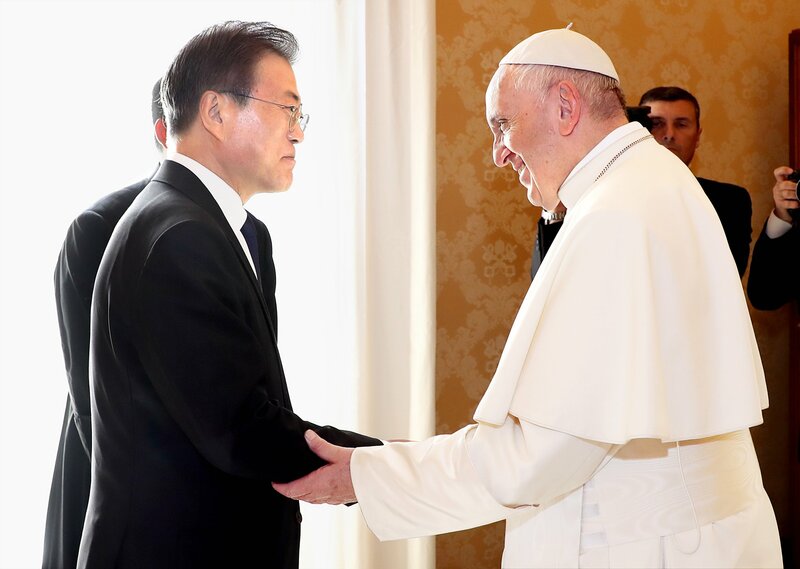 When President Moon asked if Chairman Kim should send a letter of invitation, Pope Francis said that the message President Moon conveyed was sufficient, but it would be good for Chairman Kim to send an official invitation. The Pope added that he would definitely answer if he got the invitation and that he would be available, Cheong Wa Dae said.